Chuck Sakryd is a native of Cleveland, Ohio. Born in 1952 he began collecting license plates at the ripe old age of five. He would rescue plates from curbside trash cans and bring them home. It took him awhile to wonder why his collection wasn't growing. The reality was his mom would throw them out when Chuck wasn't looking. Despite this traumatic beginning a passion was born and it has never stopped. Chuck joined ALPCA in 1968 just before his 16th birthday. He served as Vice President in 1991 and as a Director in 1984-1985. He became the club's first regional chairman serving from 1983 to 1989. A fixture as auctioneer at the national conventions he frequents numerous Regional meets every year as well as the annual Hershey car show. 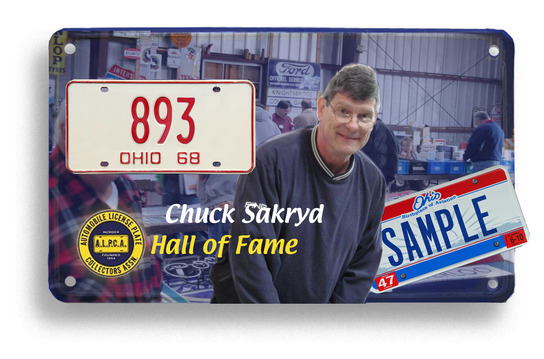 He founded the Ohio Region and has been a frequent contributor to the club newsletter with stories on Ohio tags. His articles appeared under the headings "Lake Erie Items" and "Ohio calling". In 1984 he wrote one of the first stories on Mexican plates. He made several trips to Mexico to conduct research and the story serves as a major source to this day for anyone collecting Mexican tags. In 1987 he wrote a piece on metal revalidation tabs. Chuck is often a first contact for new members sending welcome greetings to the club and offering guidance that would include a list of plates for sale. In that way new collectors could get a leg up on building their collections. When pressed, Chuck will tell you he collects two things, "anything and everything". In fact he has an extensive sample collection and an impressive collection of AAA badges and maps. That is a reality in our world. Collecting plates often expands into all types of automobilia. His Volkswagen van with Ohio tag VW was a fixture at countless meets. He has a collection of VW related plates dating back to 1937. The VW remains in Chuck's stable but the size of his collection necessitated something bigger hence the Dodge Sprinter Van. Next step may be a Peterbilt with a 55 foot trailer. Chuck holds a Bachelor of Arts degree in political science from The College of Wooster. He wrote an independent study of the National Highway system as part of his curriculum. Chuck has been married twice and the best man at both weddings was ALPCA legend Roy Carson. At his first wedding many of his ALPCA buddies held an impromptu plate meet across the street from the church. Chuck was always about priorities. Chuck married Cyndi McCabe in 1998 and quickly showed her the charm of plate collecting. Cyndi was impressed and is a current Director of ALPCA so it is truly a family affair. Chuck worked in the banking industry and in consumer finance for fifteen years before becoming self employed in 1991. He created a business dealing with his passion of plate collecting. Few people get to do that in life. He has been featured in news articles about his hobby in the Cleveland Plain Dealer. In 2012 he became a certified Merit Badge counselor for the Boy Scouts. License plate collecting does qualify one for a merit badge. Chuck is hard to miss at the national conventions. He's the guy leaping over tables to find that next pile of plates. He has grown up with the club and has earned the respect and admiration of his peers. The ALPCA Hall of Fame is delighted to welcome Chuck to its ranks as a member of the class of 2014.